One of the most important differences between Continuous Deployment and Continuous Delivery is the level of human involvement in a pipeline. The typical Continuous Delivery pipeline requires a person to approve deployment to production, where Continuous Deployment pipelines are fully automated (every feature that passes tests and checks is deployed right way). 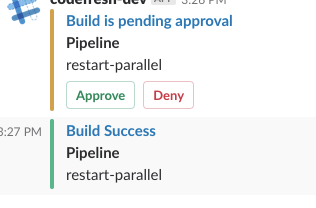 After several customer requests, Codefresh has implemented the final piece of this puzzle and allows you to pause a pipeline before moving on. waitForInputBeforeProduction: type: pending-approval title: Deploy to Production? If the user rejects the step, the test environment is never destroyed. This is accomplished by using the standard step dependencies in Codefresh. The destruction step in this pipeline is checking the approval status before actually continuing. Otherwise, it is skipped. A more advanced use case is to use a single approval step in order to take a binary decision within a pipeline. So instead of using it as a gateway to production, you can actually choose for the deployment target. The approval step is available to all Codefresh plans. Notice that during the approval phase no pipeline resources are consumed. See the documentation for more details.